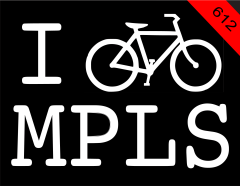 IBIKEMPLS.com - it's where I get all my news: Daddy Long Legs, Who Did Name You? Daddy Long Legs, Who Did Name You? This guy had me chuckling for a bit. His name is DJ Flula and he's funny like Neil Hamburger. Well, maybe not that funny. The clavicle is mending up nicely. The bone isn't quite set-up, but I've made noticeable mending progress in the past few days. It's going to be a while before I can get rad again, but no worries, it's all part of the process. October is Rideshare to Work Month!